Not to be confused with Epsilon. Upsilon (/ˈʌpsɪlɒn, ˈjuːp-, ˈuːp-, ˈʊp-, -lən/; or UK: /ʌpˈsaɪlən, juːp-/; uppercase Υ, lowercase υ; Greek: ύψιλον ýpsilon [ˈipsilon]) or ypsilon is the 20th letter of the Greek alphabet. 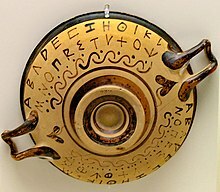 In the system of Greek numerals, Υʹ has a value of 400. It is derived from the Phoenician waw . In early Greek it was pronounced like English "long" oo (or o͞o) [u]. In Classical Greek, it was pronounced like French u or German ü, i.e., [y] (a sound that is not found in most dialects of English). This was the case at least until the year AD 1030. In Modern Greek it is pronounced like continental i or English ee, [i], and in diphthongs, [f] or [v]. In ancient Greek, it occurred in both long and short versions, but this distinction has been lost in Modern Greek. in order to avoid confusion with a Latin Y denoting the hypercharge. In linguistics, the symbol ⟨ʋ⟩ is used to represent a labiodental approximant. refers to the mass-to-light ratio. (Unicode ♈ U+2648) is used for the astrological sign of Aries. ^ "Upsilon". Merriam-Webster Dictionary. Retrieved 2016-01-22. ^ "Upsilon". Oxford Dictionaries. Oxford University Press. Retrieved 2016-01-22. ^ "Upsilon". Dictionary.com Unabridged. Random House. Retrieved 2016-01-22. ^ Oxford English Dictionary, 3rd ed. "upsilon, n." Oxford University Press (Oxford), 2013. ^ Brewer, Ebenezer Cobham. The reader's handbook of famous names in fiction, allusions, references, proverbs, plots, stories, and poems, Vol. 2, p. 956. Lippincott, 1899.